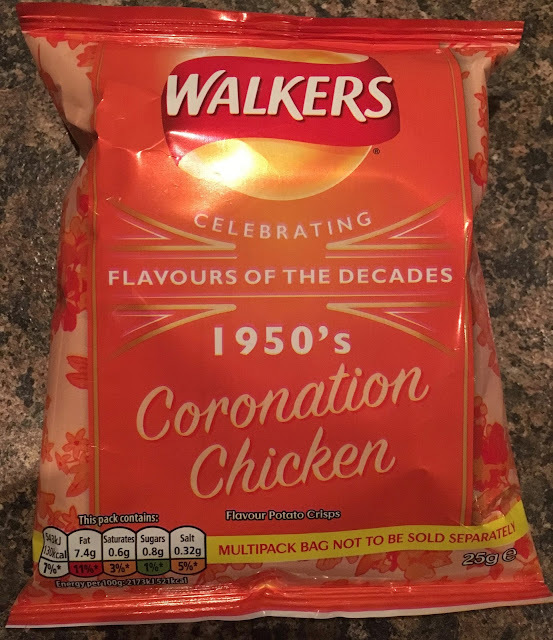 As part of Walkers ‘Celebrating Flavours of the Decades’ editions this Coronation Chicken celebrates the 1950s, namely the coronation in 1953 of Queen Elizabeth the second (or ‘first’ to the Scottish), and the creation of this unique chicken meal that was to become iconic of that time. I have eaten Coronation Chicken before, which was cold, creamy, mildly curry flavoured and it went well with a salad. Of course, Walkers crisps are one of this country’s iconic crisp manufacturers. So an iconic chicken dish made into a flavour by an iconic crisp manufacturer… what can go wrong? On smell I’d say this could be any mild curry sauce, much like a chip shop curry sauce flavour. On taste these crisps could definitely be mistaken for chip shop curry sauce flavoured crisps. I can see how this could come about though. 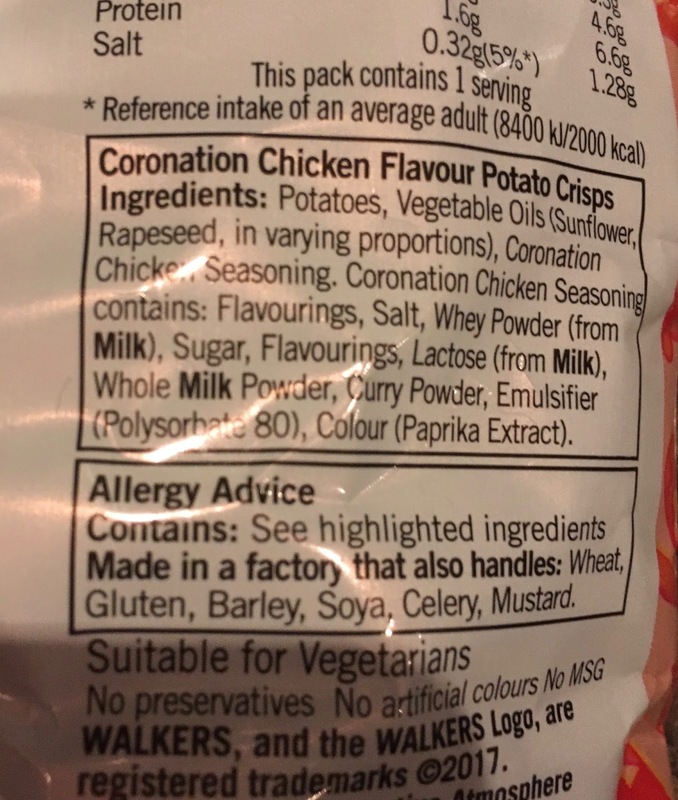 It’s quite simple I suppose, with chip shop curry sauce we dip in chips, so the potato flavour is naturally there, where it isn’t with Coronation Chicken. 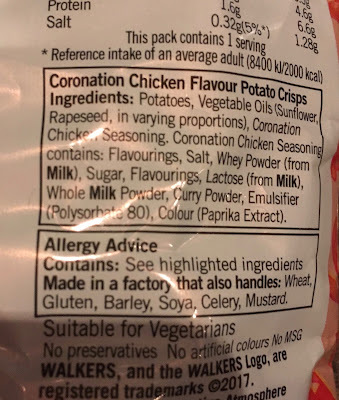 I tried a pile of crisps shoved into my gob rather than one daintily at a time, and strangely the flavour changed slightly with more chicken shining through. So there is chicken flavour here as well as the mild curry sauce… you just have to eat more! The 25g packet has 130 calories, with 7.4g of fat, 0.8g of sugar and 0.32g of salt. These crisps are suitable for Vegetarians. See photograph for ingredients.